The Midrash Tanchuma asks how it is that Moshe went from being a man in Sefer Shmos of few words, who could barely speak, to a man of many words, and an orator of such eloquence…how did he get from לֹא אִישׁ דְּבָרִים אָנֹכִי to אֵלֶּה הַדְּבָרִים ? The “tree of life” in this passuk is Torah, and so the the Torah represents the power to improve and direct our speech toward something great. Indeed the Torah is meant to teach us a romantic language – one between man and Hashem and one between man and man. Hashem’s words give us the capacity to make a meaningful life, for ourselves and those that hear the words we produce. How do we fulfill this goal of having our entire day filled with words of Torah? If we’re not sitting and learning the entire day, how can we make Torah our day-long conversation? By using the unique power of speech humans were granted to speak and conduct ourselves properly. 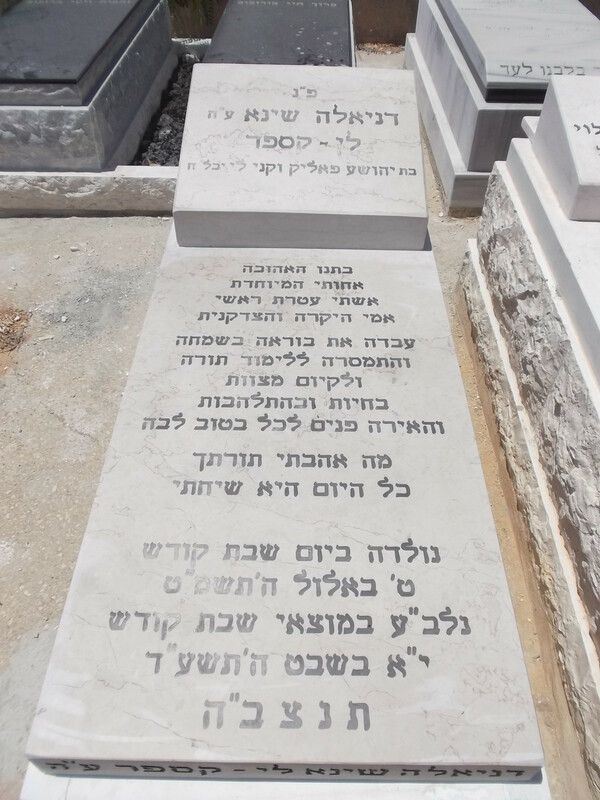 It is this overwhelming importance of speech that makes Lashon HaRa such a grave offense, and why abuse of speech brought the destruction of the Beis HaMikdash. The Gemara in Erachin 15b quotes Tehillim, which says: Hachaim vehamavet beyad halashon, “Life and death are in the hands of the tongue.” The Gemara discusses why the expression “in the hands” is used. Beyad means “dependent on,” but it is unusual that the verse uses another part of the body for this expression – the toungue obviously does not have hands. The Gemara explains that the verse uses this particular phraseology in order to juxtapose the hand with the tongue: “ma yad meimita, af lashon meimita” = “in the same way that a hand can kill, so too the tongue can kill.” Words from the tongue are just as capable – in fact more capable – of inflicting physical harm as the hand. This passuk was chosen for Daniella’s kever and so magnificently encapsulates Daniella’s way of approaching her day and the world – always speaking and interacting in the ways of Torah, with kind words and no judgments. The more Torah and Torah values we study and personify, the more significance our prayers will have. Just as a person cannot pick up a musical instrument and produce beautiful music without practice, and just as Moshe needed Torah and closeness to Hashem to learn to produce the beautiful words of Sefer Devarim, so too is Torah the key to our refined speech and d’veikus, both with Hashem and our fellow man.